In Jordan’s prize-winning debut, prejudice takes many forms, both subtle and brutal. It is 1946, and city-bred Laura McAllan is trying to raise her children on her husband’s Mississippi Delta farm—a place she finds foreign and frightening. In the midst of the family’s struggles, two young men return from the war to work the land. Jamie McAllan, Laura’s brother-in-law, is everything her husband is not—charming, handsome, and haunted by his memories of combat. Ronsel Jackson, eldest son of the black sharecroppers who live on the McAllan farm, has come home with the shine of a war hero. But no matter his bravery in defense of his country, he is still considered less than a man in the Jim Crow South. It is the unlikely friendship of these brothers-in-arms that drives this powerful novel. Hillary Jordan grew up in Texas and Oklahoma. She received her BA in English and political science from Wellesley College and spent fifteen years working as an advertising copywriter before starting to write fiction. She got her MFA in creative writing from Columbia University. Her first novel, Mudbound, won the 2006 Bellwether Prize for Fiction, awarded biennially to a debut novel that addresses issues of social justice, and was the New Atlantic Independent Booksellers Association Fiction Book of the Year for 2008. Jordan’s short fiction has appeared in numerous literary journals, including StoryQuarterly and the Carolina Quarterly. She lives in Tivoli, New York. The setting of the Mississippi Delta is intrinsic to Mudbound. Discuss the ways in which the land functions as a character in the novel and how each of the other characters relates to it. 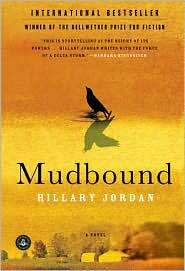 Mudbound is a chorus, told in six different voices. How do the changes in perspective affect your understanding of the story? Are all six voices equally sympathetic? Reliable? Pappy is the only main character who has no narrative voice. Why do you think the author chose not to let him speak? Who gets to speak and who is silent or silenced is a central theme, the silencing of Ronsel being the most literal and brutal example. Discuss the ways in which this theme plays out for the other characters. For instance, how does Laura’s silence about her unhappiness on the farm affect her and her marriage? What are the consequences of Jamie’s inability to speak to his family about the horrors he experienced in the war? How does speaking or not speaking confer power or take it away? The story is narrated by two farmers, two wives and mothers, and two soldiers. Compare and contrast the ways in which these parallel characters, black and white, view and experience the world. What is the significance of the title? In what ways are each of the characters bound — by the land, by circumstance, by tradition, by the law, by their own limitations? How much of this binding is inescapable and how much is self-imposed? Which characters are most successful in freeing themselves from what binds them? All the characters are products of their time and place, and instances of racism in the book run from Pappy’s outright bigotry to Laura’s more subtle prejudice. Would Laura have thought of herself as racist, and if not, why not? How do the racial views of Laura, Jamie, Henry, and Pappy affect your sympathy for them? The novel deals with many thorny issues: racism, sexual politics, infidelity, war. The characters weigh in on these issues, but what about the author? Does she have a discernable perspective, and if so, how does she convey it? We know very early in the book that something terrible is going to befall Ronsel. How does this sense of inevitability affect the story? Jamie makes Ronsel responsible for his own fate, saying “Maybe that’s cowardly of me, making Ronsel’s the trigger finger.” Is it just cowardice, or is there some truth to what Jamie says? Where would you place the turning point for Ronsel? Who else is complicit in what happens to him, and why? In reflecting on some of the more difficult moral choices made by the characters — Laura’s decision to sleep with Jamie, Ronsel’s decision to abandon Resl and return to America, Jamie’s choice during the lynching scene, Florence’s and Jamie’s separate decisions to murder Pappy — what would you have done in those same situations? Is it even possible to know? Are there some moral positions that are absolute, or should we take into account things like time and place when making judgments? How is the last chapter of Mudbound different from all the others? Why do you think the author chose to have Ronsel address you, the reader, directly? Do you believe he overcomes the formidable obstacles facing him and finds “something like happiness”? If so, why doesn’t the author just say so explicitly? Would a less ambiguous ending have been more or less satisfying?